Walking amidst the towering longleaf pine trees and grassy undergrowth on a clear yet humid Sunday morning, my second birding trip (W.G. Jones State Forest in Conroe, TX) had a distinctly different feel than the previous overcast and rainy one at Brazos Bend. There was less crowding of shrubs and trees and the resulting open space made it easier not only to find birds but also follow them as they flew from tree to tree. Check out Figure 1 for a view. W.G. Jones State Forest is known for its Red-cockaded Woodpecker (scientific name Picoides borealis) management area where habitat restoration via controlled fires is conducted (check out this video by user KennethKramm on YouTube for more info). 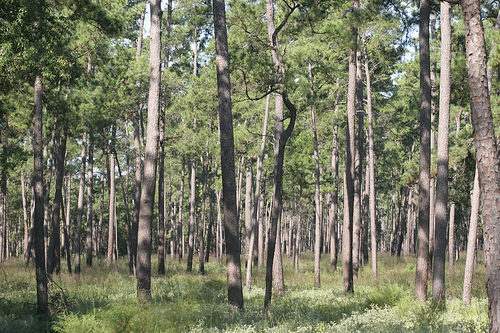 Our walk around the longleaf pines did not disappoint as we saw at least 2 Red-cockaded Woodpeckers that day. My focus on this entry, however, will be on the Red-cockaded Woodpeckers cousin, the Red-bellied Woodpecker (scientific name: Melanerpes carolinus). We were quite fortunate to see the Red-bellied Woodpecker here in southeast Texas as that is towards the edge of its range in North America (Figure 2). After getting to witness the white and black patterns of a Red-cockaded Woodpecker and a downy woodpecker, my eyes lit up as I saw the red nape of what I knew had to be a Red-bellied Woodpecker perched sideways several meters up on a longleaf pine. Although the namesake of a Red-bellied Woodpecker is a faint stretch of red feathers on its lower belly, this area is very hard to see so a much easier field mark is the red nape. Seeing as how this Red-bellied Woodpecker had a nape that extended over the top of its head, I knew it must be a male. While I wasn’t able to take any pictures, check out Figure 3 for a close up look of the creature I saw. Just as I was beginning to examine its barred back and red-orange face, the Red-bellied Woodpecker flew off and went to another tree. Fortunately, I was able to track it – at least for a while. Eventually I lost the bird and focused my attention on the Red-cockaded Woodpecker and Brown headed Cowbird (Molothrus ater) Anyway, let’s take a look at what the literature says about the Red-bellied Woodpecker. An important aspect of a species’ survival is its ability to deal with competitors. 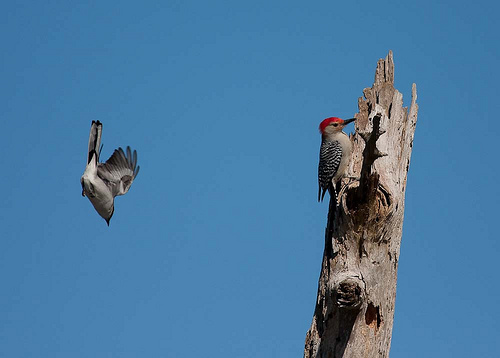 A 1989 paper by Danny Ingold from Mississippi State University looked at the competition between the Red-bellied Woodpecker, the Red-headed Woodpecker (Melanerpes erythrocephalus) and the European Starling (Sturnus vulgaris) for nesting sites in both rural and urban areas of Oktibbeha County, MS. 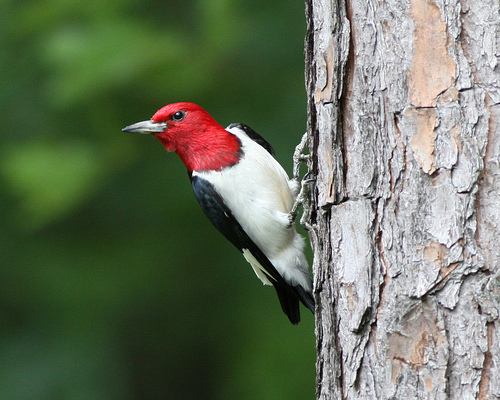 Check out figure 4 for a picture of the Red-headed Woodpecker. Whereas many of the Red-headed Woodpeckers did not tend to breed at the same time as the other two species of birds and therefore were not always in direct competition with them, the Red-bellied Woodpecker and the European Starling had very close breeding times and tended to be in more competition. The Starling was generally the “winner” of this confrontation as it usurped more nests from the Red-bellied Woodpecker (Figure 5). 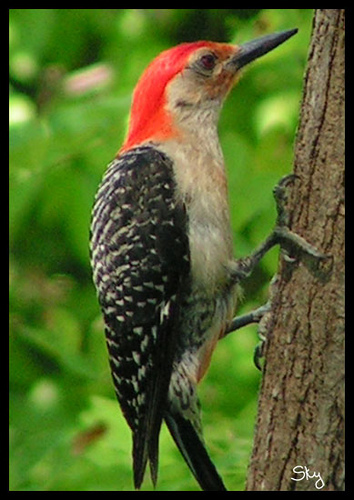 Fifty-two percent of Red-bellied Woodpeckers nest cavities were usurped by the Starling compared to only 7% of the Red-headed Woodpecker by the Starling. Ingold suggests that this will cause selective pressure and result in a shift in the breeding season of the Red-bellied Woodpecker in east-central Mississippi as those Red-bellied Woodpecker who avoid nesting competition with the Starling will have a higher fitness. But what if the Red-bellied Woodpecker in Oktibbeha County, MS don’t want to change their breeding season? Well they could just take a page out of the RWB I saw at Jones State Forest and just fly somewhere else, right? A 1999 paper by Grubb and Doherty looked at a phenomenon known as gap-crossing. Gap-crossing occurs when an organism crosses a large stretch of inhospitable habitat from one metapopulation to another. The researchers wanted to investigate what features of a particular species of bird correlated with its ability to gap-cross. They surveyed 47 woodlots in three counties in northeastern Ohio and recorded when a particular bird would arrive at a woodlot as well as leave a woodlot. Each woodlot was also measured and its geographical proximity to other woodlots was evaluated to assess how difficult it would be to go to that woodlot from another one. The researchers found that woodlot area was a large predictor of whether or not a bird would leave the particular woodlot, as those with a larger perimeter were less likely to have birds leave (check out Oram’s 1991 review of metapopulation theory and habitat fragmentation for a more in-depth look). The other predictor turned out to be the size of the bird. Unfortunately for the Red-bellied Woodpecker, it was in the middle of the pack of birds studied and the mean distance it traversed to go from one woodlot to another was only 200 meters (Figure 6). At Jones State Forest we saw many different kinds of woodpeckers (downy, Red-bellied Woodpecker, Pileated Woodpecker, Red-cockaded Woodpecker) so let’s take a look at some research that considers how two different species of woodpecker – the Red-bellied Woodpecker and Red-headed Woodpecker interact with one another and how their behavior differs. A 1972 paper by Ann Reller investigates what behavioral and temporal activities of the two species of woodpecker allow them to coexist in eastern North America. Particular interest was given to how they ration their time with respect to changes in the season and the environment. Reller found that what allows these two species of woodpecker to coexist is their niche segregation during breeding season. This allows one species fitness to be relatively unaffected by the others during breeding season, and although aggression does take place during non breeding season, it does not seem to be enough to warrant a significant advantage to one species over the other. 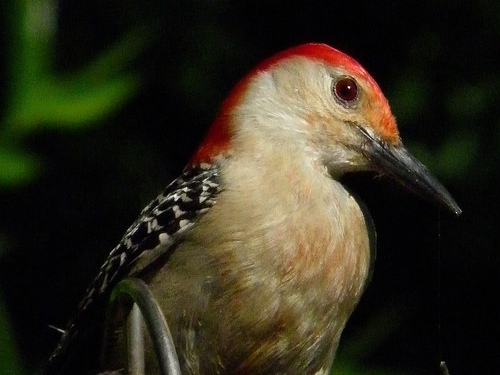 Also be sure to check out Jerome Jackson’s 1976 paper which takes a deeper look into breeding differences between the Red-bellied Woodpecker and Red-headed Woodpecker. Seeing the various kinds of woodpeckers was a fulfilling reward for a college student waking up at 6:00 AM on a Sunday morning. Their subtle differences in appearance are only the tip of the iceberg, as it is their niche differentiation that enables them to thrive alongside their cousins. 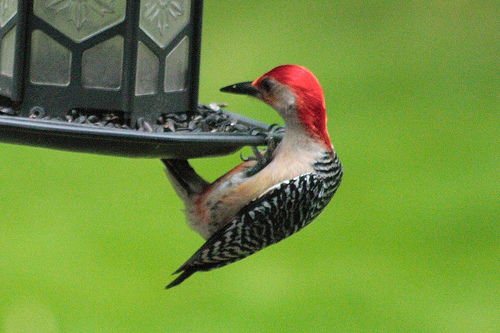 Check out some more pics of the Red-bellied Woodpecker (figures 7-9)! Fig. 5. 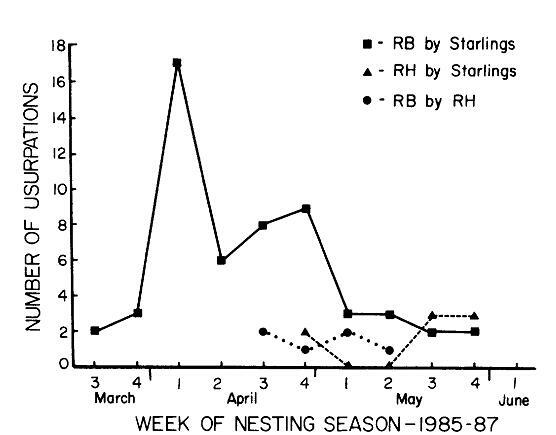 A graph from the Ingold paper showing nest usurpations by each of the main species observed on each other. The primary victim was shown to be the Red-bellied Woodpecker by the European Starling (black box). The triangle shows nest usurpations of the Red-headed Woodpecker on the Starlings. The circle shows nest usurpations by Red-bellied Woodpecker on Red-headed Woodpecker. Figure 6. 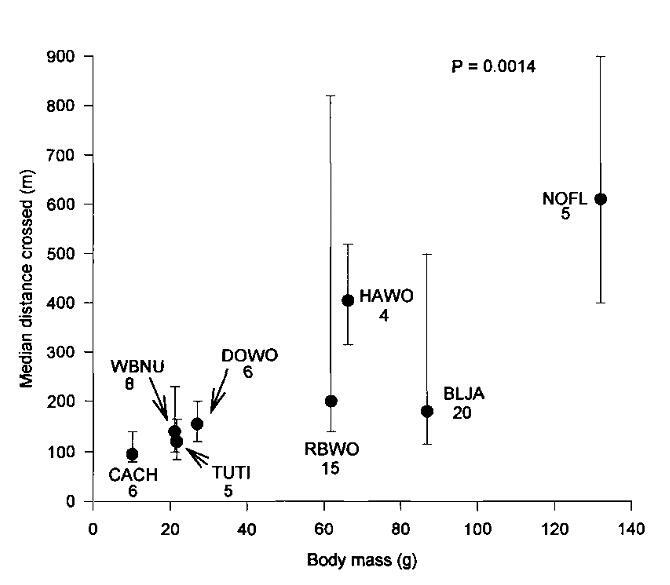 A graph from the Grubb paper showing the relationship between body mass and the mean distance crossed from one woodplot to another for 8 species of birds in NE Ohio. The Red-bellied Woodpecker was near the middle of the pack. Grubb, T.M. 1999. On home-range gap crossing. The Auk. 116(3)618-628. Ingold, D.J. 1989. Nesting phenology and competition for nest sites among red-headed and red-bellied woodpeckers and European starlings. The Auk. 106(2)209-227. Jackson, J.A. 1976. Comparison of some aspects of breeding ecology of red-headed and red-bellied woodpeckers in Kansas. Condor. 78(1)67-76. Opdam, P. 1991. Metapopulation study and habitat fragmentation: a review of holarctic breeding bird studies. Landscape Ecology. 5(2) 93-106. Reller, A.W. 1972. Aspects of behavioral ecology of red-headed and red-bellied woodpeckers. American Midland Naturalist. 88(2)270-290. This entry was posted in Woodpeckers. Bookmark the permalink.